! Let’s get to it. A strong and sturdy length of string. You Can also use a chain or thin rope if you prefer. A large handful of small ribbons. The colors can vary as it’s really up to you, but mixing up the colors for a fun rainbow effect certainly can’t go wrong! The real artisan ship comes into how you actually arrange the colors of your ribbon. 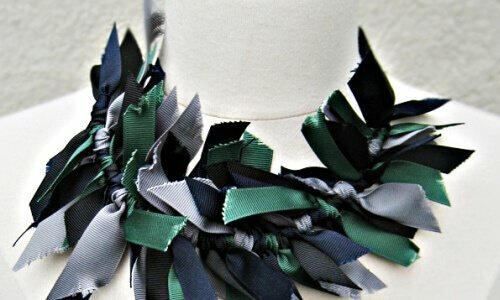 For a classy look, you can use all black or white ribbon – suddenly the necklace is now appropriate for a gala event. For a more fun kid friendly approach, simply arrange the colored ribbons at random, creating a haphazard and crazy effect that is sure to match a more eclectic style. For a look that’s somewhere in between you’ll want to experiment with arranging blocks of color. This is similar to a rainbow, except there will be multiple ribbons of the same color next to each other.